Juicing ended a day earlier than planned, because as it turns out — I have to go to Baltimore on Tuesday for an unplanned series of days work down there. So I needed to spend Monday transitioning back to food. Yea — everything in life, well….everything well done in life ….. involves a transition. Hey. Hold Up. That’s P.E.R.F.E.C.T. actually. Remember – this process has been all about re-starting, and transforming, and becoming. Becoming a butterfly! Transition appears to be the perfect word for what should happen next. THIS is the phase where we use our little butterfly feet..(do butterflies have feet??) …and kick our way out of the cocoon! So, let’s go. Get kicking. We’ve got transitioning to do. I feel my orange-ness building. My wings are ready to sprout. I’ve outgrown this juice, this chrysalis is too small for us now. The world await. Time to F.L.Y. Well, you don’t go from drinking green juice to drinking coffee and eating steak overnight. Well — not if you don’t want to spend the day with a severe bellyache. So transitioning back to food is the process for the next few days. Diane-the-Rule-Follower is on. the. case! This butterfly isn’t gonna be born with a bellyache. Um, do butterflies have bellies? Well, I sure hope mine has some pretty speckles on it. Breakfast was fruit. A small amount. It’s amazing how not-hungry I feel. My stomach shrank I’m sure of it. I did have about 1/4 cup of coffee. I just missed it sooo much. I was prepared to drink the entire cup, but after a few sips, my stomach started to complain. Deciding early to listen to my body — stopping at the 1/4 cup was just perfect. For lunch I had a big plate of steamed brocolinni, red bell pepper, and onions. Filling, warm, refreshing. It was everything I was craving by this point. Later in the day — I made myself a Garden Lites Butter Nut Squash souffle. I’d heard about it on our WW facebook page from another member. It was very very good. Only 5PPV for a nice size portion. The warmth and slight sweetness was such a treat. Fullness came quick. Peter, my wonderful husband, made us a delicious Vegetable Soup for dinner. He made Emeril’s Garden Vegetable Soup from a recipe he found on Good Morning America. Our entire family enjoyed it together for dinner, with a small side of grilled chicken — if my body was ready. The entire day was light, yet satisfying, and I was feeling A.W.A.K.E and A.L.I.V.E and Ready For Flight! 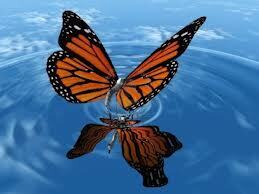 Did you know when a butterfly first comes out of its cocoon, its wings are new, and wet? They need to spend some time drying out, before they are able to take flight for the first time. This is the phase I believe I am in. I’m HERE. I’m NEW. I’m VIBRANT. I’m Drying Out.